The Jumbo version of Elbow Friend adds an extra 2 inches of length so you can upgrade those bigger armrests with the ultimate ergonomic cushion. 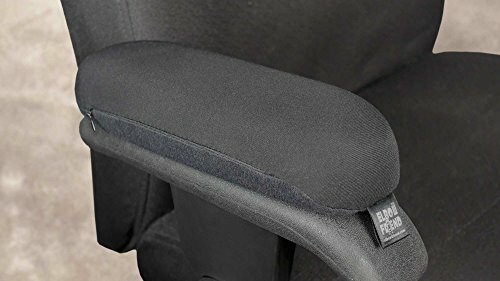 Use it to comfortize most home/office or computer chairs that have those annoying hard plastic, wood or metal armrests. The Elbow Friend cushions attach in seconds, just lay down the E-Z stick Velcro to your chair and put the Elbow Friend cushion on, for an instant upgrade to 1st class, plush comfort. From boardrooms to dorm rooms, trust the Elbow Friend to make those old, worn, ugly armrests newly comfortable and stylish again in offices, work stations, design stations, waiting rooms, patios, directors chairs and home computer chairs. Originally conceived to combat the pains of Tennis Elbow while working in a computer chair, the Elbow Friend product line has expanded, and are now Occupational Therapist recommended, fight Forearm Fatigue, are hand washable, and are built to withstand the test of time. You don't need to buy a new chair, and you don't have to wait to be comfortable, just comfortize the chair you've got right now! If you have fabric or leather armrests, or antique furniture, order the separate E-Z Strap Kit and you can attach your Elbow Friend with straps instead of the E-Z stick Velcro. Auto versions are also available, please see the Elbow Friend Auto and Console Buddy! product pages. Wheelchair versions are also available, please see the Wheelchair Friend product page. If you have any questions about this product by Elbow Friend, contact us by completing and submitting the form below. If you are looking for a specif part number, please include it with your message.